So you’ve finished your masterpiece. You’ve had it reviewed by peers, beta readers, a few trusted friends. You’ve revised and revised, written a second draft or even a third, polished some more, and at last you feel ready to release it to . . . no, no, not the world! What you need next is a freelance editor—and you clearly already know that because you’re reading this article. Every writer needs an editor. But it’s confusing and sometimes overwhelming out there in the world of editorial services, and perhaps you’re unsure of how to go about hiring a freelance editor. Following are four steps to help ensure you find the ideal editor for your manuscript. But first, congratulations on your decision to hire an editor. With the rise of self-publishing and the ease with which anyone can see their work in print and e-book form today, too many unedited manuscripts are being submitted to POD or e-book companies like CreateSpace, Lightning Source, Lulu, or BookBaby. The overall quality of these books is inferior (just read some Amazon reviews), resulting in a lingering stigma attached to the word “self-published.” It follows that the more authors who hire a freelance editor before self-publishing, the faster this stigma will disappear. And increasingly, hiring a freelance editor doesn’t only apply to self-publishing authors. If you’re seeking an agent with the goal of finding a traditional publisher, you’ll discover that many agents today will request that your manuscript be edited before you submit it. Hiring an editor is one of the most important business and creative decisions you’ll make in the process of getting your book to market. You owe it to yourself and your readers to hire the best editor you can find for your manuscript. It’s also a hefty financial investment that requires careful research and consideration. With that in mind, let’s take a look at what you need to think about now and as you’re taking this big step. So plan ahead. Determine your overall budget for the project, allotting a certain amount for each step. Then find an editor who can work within the editing portion of your budget. The more homework you do, the better your chances are of getting the most bang for your buck in each of these stages of the publication process. 2. What you can expect. Of course, you expect professionalism. To that end, check the editor’s credentials and references carefully, using the tips in point #3 below. Then, besides examining an editor’s credentials, use your intuition and your gut feeling about his or her personality. You want to hire an editor who seems like a collaborative person, open to your suggestions, your ideas, and your style. You want to hire someone who’s in tune with you and your writing, someone with whom you feel comfortable right from the start, someone who will advocate for your book. Personalities differ, and not every editor’s ideas mesh with every author’s. Your editor’s energy should match your own, and you have every right to expect that your editor will be empathetic, gentle with criticism, and ethical. The human touch is an intangible, but something you’ll sense if you’re paying close attention. Don’t expect a freelance editor to be available immediately. Although some may be, many good editors are booked several months in advance. Hire your editor as far in advance as possible. When submitting a sample of your writing or the full manuscript, you should expect complete confidentiality regarding the content of your work. Ethical editors never breach client confidentiality. During the edit, you can expect that your editor will have ideas to contribute to your manuscript that hadn’t occurred to you. Working with a freelance editor will likely shed light on areas of your manuscript you haven’t thought to examine. You should be open-minded and ready to consider, if not embrace, any recommendations your editor may have. Expect criticism. This is a biggie. The unvarnished truth is that a good editor is a critic. You’re paying good money to receive criticism from a professional with the goal of improving your work. Hard as it may be, try not to be sensitive or to take things personally. But—and this is important—you should expect your editor to deliver the criticism in the kindest possible way, gently, constructively, with positive suggestions for improvement. Your months or years of work should be treated with care and respect. And you should expect to come away from the edit enlightened and excited to move ahead. Expect to do revisions. This is another biggie. Some authors contact me with the misconception that once the first pass of editing is complete, the manuscript is now ready to become a book. But not quite yet! Your editor will make many suggestions for change and improvement, and you’ll need to go through the manuscript word by word, meticulously revising as needed. In some cases you may have to move scenes around or rewrite entire chapters. Revisions are a big part of the editorial process that first-time authors sometimes neglect to factor in. 3. Your search. So where do you find your ideal editor? Remember that not all editors are created equal. You can go about searching for a freelance editor in several ways. Following are your main options. • Search the Internet. Type in key phrases like “editorial services” or “manuscript editor.” If you go this route, once you’ve found a potential candidate, make sure you’re comfortable with the editor’s overall approach to business. Does her website tell you everything you want to know about her services, including prices? Does the site appeal to you on some level—perhaps you get a good vibe from the tone or the visuals? Again, use your gut. Does the editor appear to have experience in your niche or genre? Does she have lots of references you can contact? Assess her skill level and the type of editing she specializes in. You probably have a general idea of what level of editorial services you need. Developmental editing? Structural editing? Copy editing? If you’re unsure, see my definitions of editorial levels, then seek out editors whose skills match your needs. • Get referrals from other writers. Do you belong to a writers’ group, perhaps a LinkedIn group, or an online forum? Tap into all your writing connections and put the word out that you’re thinking of hiring an editor. You’re bound to get all kinds of feedback. 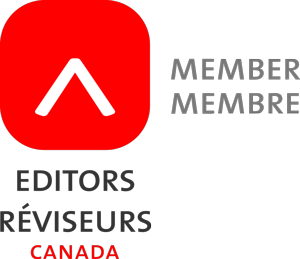 • Look at membership directories in editors’ associations in the US, Canada, the UK, or Australia. (You can find these listed on my Resources page here.) Each of these has membership lists where you can search for editors with the skills you need. • Post the job. Posting on job boards like Elance or Freelancer.com may be casting too wide a net, although you can certainly try them. Just be sure to be specific in your search terms. Better yet, each of the associations mentioned in my previous point has a job board where you can post the details of your job, along with your budget and any other considerations. The downside to this is that you’ll likely receive a small flood of résumés, and you’ll have to spend a good chunk of time going through them, testing the ones you’re interested in by having them do a sample edit, and examining and comparing the test samples. But that’s something you should do anyway, which brings me to the next step. 4. Your research. The next step is to narrow your list of potential editors to just two or three. As you’ve likely gathered by now, editors not only specialize in a vast array of genres and fields, they vary widely in their experience. For example, I typically work at the substantive, structural, stylistic, and copy editing levels with self-publishing authors on fiction and nonfiction; I also do proofreading. I don’t usually edit educational, medical, corporate, or government materials. A copy editor who deals daily with only the mechanics of the English language may not have the expertise to help you restructure your plot or develop your characters. Fiction editing requires additional skills. Okay, so you’ve narrowed your list, found two or three editors with solid experience in your niche, and they appear to be skilled in the level(s) of editing you think you may need. Next, phone or begin an e-mail dialogue with each editor and listen carefully to determine their suitability. Discuss your project, and gauge their enthusiasm level. Once again, use your intuition. Does the editor’s energy match yours? Does she make you feel comfortable and relaxed? Does she sound knowledgeable? Discuss rates and prices. Do you get the sense that she is ethical? Ask to see before-and-after samples, which some editors may provide (with their author’s permission, of course). Submit a sample of your own writing and ask her to confirm what levels of editing are required. Ask for a small sample edit. From this sample and your total word count, a skilled editor will be able to tell you what kind of editing you need and what the estimated cost will be. On your own, check credentials, testimonials, and references. Contact two or three of the editor’s clients to learn of their experiences with her. Important: If you’re testing more than one editor, send each the same sample so you can make a direct comparison between their skills and editing styles. Some editors will do a free sample edit; others will charge a minimal amount for a sample edit. Don’t discount those who charge; they may well be the busiest, most experienced editors and perhaps more likely to do the best work for your needs. Even though I have dozens of glowing author testimonials here on my website, I would be remiss if I didn’t add this caution: when doing your research, be a little circumspect about testimonials and recommendations from other authors. Because they’re not editors themselves, even though they may be satisfied with the editor’s work, authors may not truly know what constitutes a good editor. Of course, they’ll be able to tell you if working with a particular editor was a pleasant, rewarding experience, and that counts for a good deal. But ideally, try to get referrals from other editors, if that’s possible. If you’re considering hiring a certain editor, try contacting her colleagues or her association to verify her credentials. Get a feel for that editor’s reputation in the editorial community and publishing industry. In all cases, do your due diligence. Put in the time and effort required to make an informed, educated choice. Editing will be one of the biggest investments of your journey into authorship (if not the biggest), and you’ll want to spend your editing money wisely. And finally, keep in mind that a good editor will always want you to get the greatest possible value out of your investment and out of your editing experience. 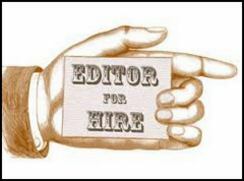 This post complements my website page How to hire a freelance editor. This is a nice overview that lets authors know what to expect when dealing with editors and reminds them that editing is only one piece of the process when it comes to publishing. I’m glad you mentioned that authors ought to hire editors when submitting their manuscripts to agents–this point is often overlooked. And I like that you urge authors not to discount editors who are charging for sample edits. I believe that those who charge for this tend to be more professional. I finally have an Internet connection and can respond, Caroline. Thanks very much for your comment! I’m sorry you had such a bad experience, James. I hope it didn’t sour you on editors in general. Partly because the industry isn’t regulated, it’s sometimes hard to judge the skill level of an editor and whether they’ll be suitable for your manuscript. That’s why I strongly recommend the steps outlined in my post. I wish you a much better experience next time around! Arlene, for both authors and freelancers.